If you have teenage kids and you worry about them when they are out at night, don’t watch Save Me. If you don’t want to be exposed to some of the most depressing realities of 21st century life, don’t watch Save Me. If you want to be sat on the edge of your seat for nearly 6 hours, do watch Save Me. Sky Atlantic’s series come from the team behind Line of Duty (which we love here at Shouting at the Telly as can be seen from our review of it last year) and it’s gritty. Imagine Mr McGritty, who drives a gritting lorry, all the way to Gritsville for Gritfest, then you would be somewhere close to how gritty this drama is. I really don’t want to give too much away about the plot but in a nutshell, it revolves around Nelly (Lennie James) who is a bit of a wastrel (wastrel, wow, where did that come from? That’s a great Chaucerian word if ever I heard one). Nelly’s estranged daughter, Jody, from a previous relationship with Dr Foster…sorry, Claire (Suranne Jones) has gone missing after telling her parents she was going to see Nelly. After ep 1: Yep, he did it. After ep 2: Oh, hold on, no, changed my mind, it was definitely the other bloke. After ep 3: Ahhhh..it could be her. After ep 4: Oh blimey, I’m completely confused now, it could be any of them! The problem with Save Me is that it is so addictive, and all the episodes are available on demand. Don’t make the mistake that I made and decide “I’ll just watch one episode after News at Ten”. After that one, you have to watch another and before you know it, it’s 1:00 am and you are thinking “well I’ve crossed the Rubicon, I may as well stay up until 2:00 am and finish the series’”. (“Crossed the Rubicon”! I’m now referencing an historical event from 49BC! I really need to stop listening the Radio 4). Did I mention I was gritty? Oh, I did, ok, well the other think about it is that the cast is quite small as it is just Nelly and his mates and a lot of the action takes place in a pub. It’s funny that people who live in big cities look down on small town dwellers or people who chose to live in the country and think that they are all inbred and stick their nose into each other’s business. Well if Save Me is anything to go, the East End of London is exactly the same, only without the pretty fields. Every night Nelly seemed to see the same people in his local and they all knew each other’s business. And I wouldn’t trust any of them as far as I could throw them. If you make it through to the final episode Adrian Edmondson pops up as a particularly unpleasant character, but that’s all I’m saying about the finale. If you are a parent and you do decide to watch it, don’t be surprised if you end up turning on the tracking feature of your children’s phone afterwards. 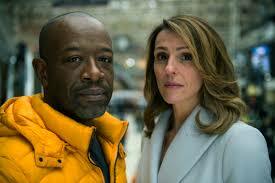 Save Me is on Sky Atlantic on Wednesday evenings at 9:00 pm or the whole series is available on demand now.